The Point of Contact Gallery is seeking published poets to display and sell their poetry collections at its annual poetry book fair. Poets’ works will be available for purchase throughout the month of April for Point of Contact’s series Cruel April, which celebrates National Poetry Month. In addition to the annual poetry book fair, Cruel April includes weekly poetry readings by poets featured in the publication “Corresponding Voices Vol. 9.” Through Cruel April, Point of Contact hopes to promote poetry and the verbal arts on an international and local level. Interested poets can fill out this consignment form and return it to the gallery or email it to amsterli@syr.edu. Poets are responsible for sending a maximum of 10 books to the gallery before March 24. 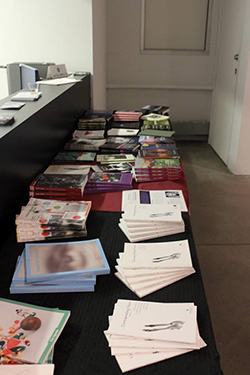 The Point of Contact Gallery then displays the books during poetry readings, where patrons have the opportunity to purchase any of the books displayed. After the final Cruel April poetry reading on April 28, poets are responsible for picking up any remaining books and a check for their profits. All books and checks must be picked up by May 13. Any questions about the book fair or Cruel April can be addressed to Amanda Sterling, administrative and marketing coordinator at Point of Contact Gallery, amsterli@syr.edu.